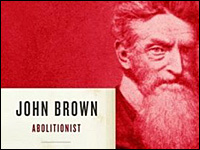 John Brown's violent campaign against slavery -- punctuated by the dramatic 1859 raid at Harper's Ferry, Va. -- made him a divisive figure, then and now. He's been portrayed as an insane fanatic and as a noble martyr. His actions unquestionably helped set in motion events that led to the Civil War. A new biography by David Reynolds examines the abolitionist's life and his far-reaching cultural impact. Linda Wertheimer talks with Reynolds.